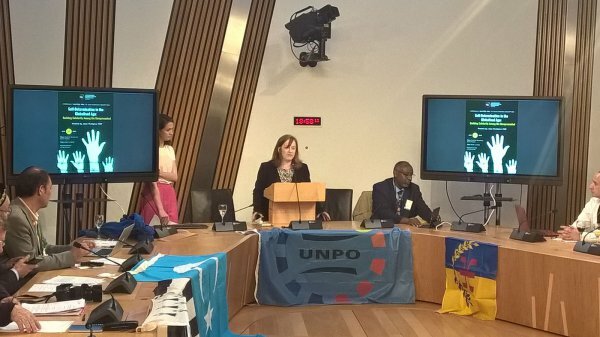 On 27 June 2017, as part of the 2017 UNPO General Assembly, the Unrepresented Nations and Peoples Organization (UNPO) held a reception at the Scottish Parliament, hosted by Joan McAlpine MSP from the Scottish National Party. The reception was organised around the theme “Self-Determination in the Globalised Age: Building Solidarity among the Unrepresented”, self-determination being an integral part of the struggle of many UNPO Members. The conference explored the increasing challenges that unrepresented Nations and Peoples face amidst ongoing globalisation and centralisation of power, as well as ways and strategies to overcome these challenges also in view of the successful experience of Scotland. Ms Joan McAlpine MSP, a member of the Committee for Culture, Tourism, Europe as well as the External Relations Committee (Convenor) and the Committee for Environment, Climate Change and Land Reform (Substitute Member), opened the reception by warmly welcoming the audience consisting of UNPO’s unrepresented peoples and communities. In her speech, the MSP addressed the principle of self-determination, recalling ‘’how the Scottish Parliament is the symbol of the progress that Scotland is making towards self-determination’’. In conclusion, she highlighted the link between the UNPO’s Members and Scotland as entities sharing the same goal, declaring ‘’We all have different experiences of being unrepresented; it is important to build solidarity and learn from each other’’. Ms Rhiannon Spear, Scottish National Party (SNP) councillor for the Greater Pollok ward of Glasgow and currently in her second term as the national Convenor of the Young Scots for Independence (YSI), emphasised the importance that unrepresented youth play in the struggle for independence. The young councillor discussed the role of social media in engaging young people in politics, stating that ‘’young people do not get involved with politics by accident’’. Ms Spear revealed that the success of the YSI originates from the fact that young people use their own direct experiences to suggest new policies. Mr Erkin Alptekin, one of the founders of the UNPO, and for many years representative of East Turkestan, spoke about his vast experience in campaigning and lobbying for unrepresented and oppressed Nations and Peoples. He highlighted the importance of providing an international platform for those who have been ignored and persecuted due to their ethnic, linguistic and cultural backgrounds. Mr Alptekin also stressed UNPO’s ethical, spiritual and material support to unrepresented and marginalised communities across the globe. Last but not least, Mr Abdirahman Mahdi, Foreign Relations Secretary of the Ogaden National Liberation Front (ONLF), Chair of the Ogaden People’s Rights Organisation (OPRO) and Vice-President of UNPO since 2015, illustrated the concept of sovereignty arguing ‘’whose sovereignty matters? The sovereignty of the people? Or that of the leaders?’’. Speaking about the case of Ogaden, Mr Mahdi stressed his belief that the principle of self-determination is a fundamental human right consenting people to be able to determine their own future and life. He also asserted how the recent drought, which led to epidemics and starvation, has put further stress on the local population and highlighted even more this lack of self-determination. The reception reminded the audience of the principles of the UNPO, as well as of the importance to collaborate and to support each other so as to achieve freedom and justice for all UNPO Members and unrepresented Nations and Peoples worldwide.